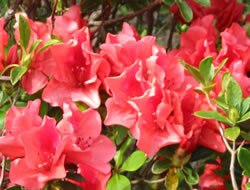 Evergreen shrub of the azalea family, is the Ryukyu archipelago unique azalea. Distributed from Amami Oshima to Okinawa main island, there are 3 to pink red 8~10cm position through April, or scarlet others equal to or greater than the large-sized with a flower height 2m of. It is a strong plant with a variety of colors of white, pink, and red. The name “tsutsuji” comes from a word “tsutsuki Saki” which means flowers bloom one after another. In the past, Samurais prefer to plant them in their gardens. Even now they are used as garden trees. Keramatsutsuji has become Murahana of Tokashiki-son, to Teruyama promenade, about 10,000 to more than trees have been planted flowering time is, you have to entertain the eyes of tourists visiting the island. The acidic soil preference relatively strong, can also be enjoyed as a potted bonsai.